June and I Started learning our music in the mid-eighties. Our dedicated parents Pauline, Mackie, Teresa and Seamus gave us every opportunity to learn and hear good music froma young age. They travelled the length and breadth of the country to brinq us to music classes, Workshops and summer schools. We are extremely grateful for the effort, energy and time invested by them in our musical development over the years. I was taught by Janet Harbison, Jimmy andf Ciarán Burns and Pat but undoubtedly the person who had the most influence on my music was my father Micheál he gave me a great insight into traditional music, as well as givinq me a 'meas' for the sonqs and airs of the tradition. 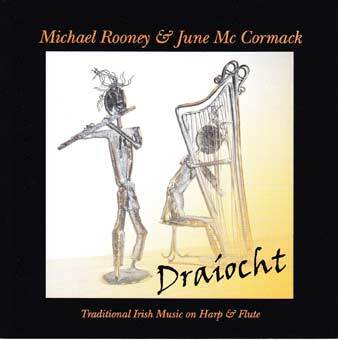 June began learning the tin-whistle and flute at home from her father Seamus and later was taught by Alfie-Joe Dineen, CarmelGunning and Paddy Ryan. From an early age June has immersed in the style of the North Connacht region. She learned much of her repertoire from the playing and recordings of the likes of Peter Horan, Fred Finn, Michael Coleman and Josie McDermott, to mention just a few. In July 1990, we both participated in the twenty first year celebration of ‘Glór Réim na hÓige’, organised by foróige Coincidently, we were asked to do a duet together for the concert which was held in UCD. That was our first time to meet and play together. In 2000, we headed off travelling and playing music for a year.. We played in tke U.SA, Australiaand New Zealandand really enjoyed it. We started talking about recording a CD together at that stage. Four years later, we finally decided that we were ready. Many of the tunes on this CD are favourites of ours. Michael has done a lot of comp[osing oiver the last few years and we’veincluded four of his compositions on this recording.